I’m at a conference on aging and design, hosted by the Institute For the Future’s Health Horizons research group. It’s just beginning, but I already have a favorite project I hadn’t seen before: Speaking Exchange, a simple social arrangement between high school students in Brazil, who want to learn English, and older adults in Chicago retirement communities who are happy for this socially engaging labor. The exchange just requires a basic video call application and teacher oversight. So many technologies for aging that make the news focus on biomedical health: apps to promote exercise and good eating habits, social robots for rehabilitative care. But many adults in the US name social isolation as a big part of their experience in later life, and it affects not only their qualititative wellbeing, but also their risk factors for physical health problems. Speaking Exchange is an elegant way to match the existing knowledge base of these elders with eager partners across the world, and across generation gaps. Hat tip to Brad Kreit. 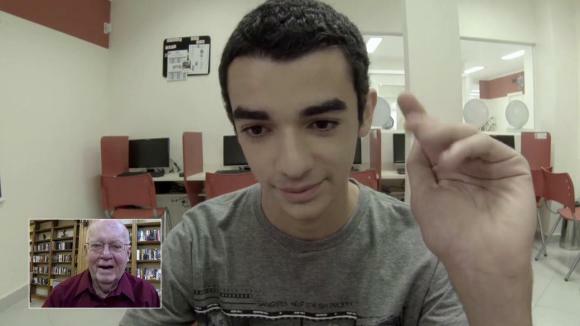 Did I ever mention to you that my students do a semester-long Skype exchange with Brazilian students about their age? Because they do. There is a Tumblr if you’re ever interested in seeing some of the results. Best, V.
That is so cool, V! I wish there were more attention to elegant social programs like this and yours. I find that my students really enjoy (and benefit from) the exchange. Interestingly, the whole project originated from a “prosthetic impulse”: Brazilian Portuguese has become more in demand versus “European” Portuguese, but I originally learned to speak “European” (and had a strong Northern Portuguese accent to match). The Skype exchange started as a way to address a specific “problem”: “What can I do about the fact that my accent is completely different from the kind of accent my students want to cultivate?” I ended up using the exchange to “compensate for” my own “shortcoming” (scare quotes intentional) in this area. Although I’m getting betting at affecting both Brazilian and “European” pronunciation and speech patterns, I still use the exchange as an extension of classroom learning.